Economics represents a field of study burdened with a bad reputation. Heinz D. Kurz, professor of economics at the University of Graz in Austria and founder of the Graz Schumpeter Center, seeks to make the discipline clearer to the lay reader. 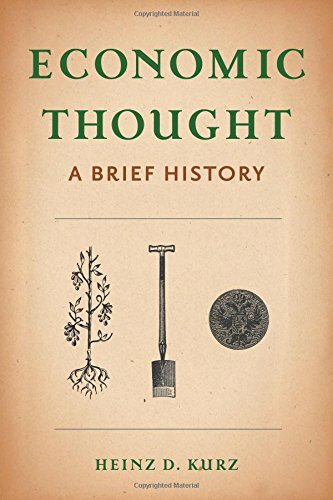 Economic Thought: A Brief History is his attempt to provide clarity and brevity to an often maligned field. The old cliché goes that economics is the dismal science. Unfortunately economics has had a reputation among non-economics for being, at worst, abstruse, and, at best, boring. Mr. Kurz begins at the very beginning of Western civilization. He traces the roots of economic thought to Plato and Aristotle. He continues by hitting all the heroes and/or villains (depending on the audience one is in) including Adam Smith and Karl Marx. Yet economic thought is more than a grocery list of famous personalities and isms. At its root economics is about how an actor (an individual, a corporation, a nation-state, etc.) goes about making informed rational decisions. The field of study is also more than quantifying humanity into a series of bylines on an accounting ledger. Throughout this intellectual history, Kurz shows the wide range of economic thought. It encompasses a variety of individuals and fields beyond the math-centric focus of modern economics. These diverse field include: philosophy (Plato, Aristotle), cultural critique (Thorstein Veblen), psychology (Daniel Kahneman and Amos Tversky), and game theory (John Nash). In a little over 200 pages, Kurz provides an illuminating, albeit dense, introduction to the history, personalities, and trends that have shaped economic thought throughout the centuries. Further on Kurz explains that “Arrow and [Gérard] Debreu proved for the first time that an equilibrium exists, provided certain assumptions concerning agents’ preferences and the set of technological alternatives are met. (The assumptions are fairly strong and are compatible with perfect competition, the workhorse of general equilibrium theory. )” Kurz’s descriptions can get rather dry and technical and the multiple references to “inputs” and “outputs” in the various economic models require attention and concentration. This isn’t a book for skimming. From ancient Greece to the modern globalized economy, Kurz distills the essence of various schools of thought and the personalities who made them. Less a college textbook and more of a guidebook, Economic Thought allows for opportunities of in-depth study. It is the perfect jumping off point for those fascinated and concerned about the devastating consequences of abstract theories guiding public policies for better or worse. With the Panama and Paradise Papers scandals, darkweb shadow economies, and Bitcoin fanaticism, Economic Thought offers a clear-eyed counterweight to social media-driven hysteria and dogmatic groupthink.